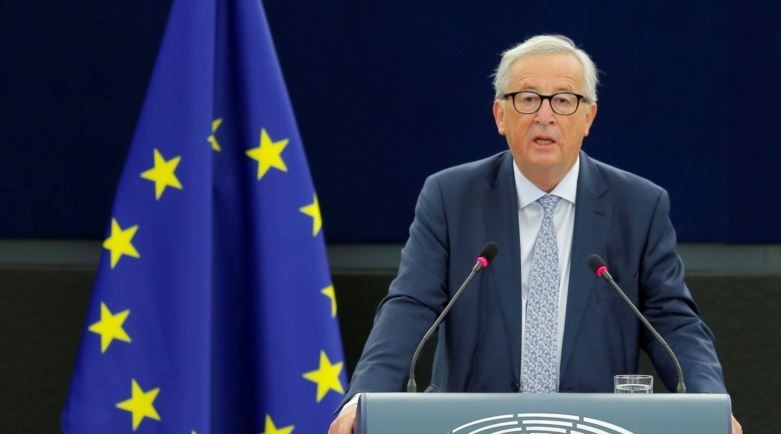 European Commission President Jean Claude Juncker called on Wednesday on the European Union to be united with regard to the Western Balkans, to prevent the interference of other factors in the region. He made these comments during the annual speech on the European Union's situation in the European Parliament. "We must be together when talking about the Western Balkans once and for ever. If we do not, then this neighboring region close to us will be shaped by others," said President Juncker. Six of the Western Balkan countries, Albania, Macedonia, Kosovo, Montenegro, Serbia and Bosnia and Herzegovina aspire to European Union integration. Senior European officials have been calling several times this year to the countries of the region to take advantage of the new EU efforts for a different approach to the troubled region due to the rise of the Russian influence, the immigration crisis, Turkey's sliding towards authoritarianism and the intent to strengthen the European integration after leaving Britain next year. Of the six Western Balkan countries, Serbia and Montenegro are seen as the first in the integration process. The European Union has expressed in favor of opening accession talks with Albania, but postponing its decision for next June. But in June next year is expected the opening of negotiations with Macedonia if it approves the change of its constitutional name in the Republic of Northern Macedonia, according to the agreement reached with Greece. Kosovo remains the last in integration processes. In all the processes it also faces the challenge that is the fact that even further, five of the 28 member states of the European Union have not recognized its independence that is opposed by Belgrade with which Pristina is involved in a process of talks on normalization of relations - a condition for both sides for European integration. President Juncker said the Commission would be harsh on European Union countries that do not respect the rule of law, amid concerns that Poland and Hungary do not respect the democratic principles of the European Union. During the annual speech, he said that the Article 7 of the European Union, a process that could lead to sanctions such as the suspension of the right to vote in the European Council, should be enforced whenever the rule of law is threatened. He called on the European Union to tighten the muscles as a world power, saying the agreement reached with US President Donald Trump to avoid a transatlantic trade war was not "any surprise" as he spoke on behalf of a united Europe. Juncker, who is entering the last year as president of the European Commission, said the EU should offer free trade agreements with the African continent and an investment alliance. He proposed the strengthening the EU's external borders with 10,000 troops to prevent economic migrants that have sparked nationalism against the EU.